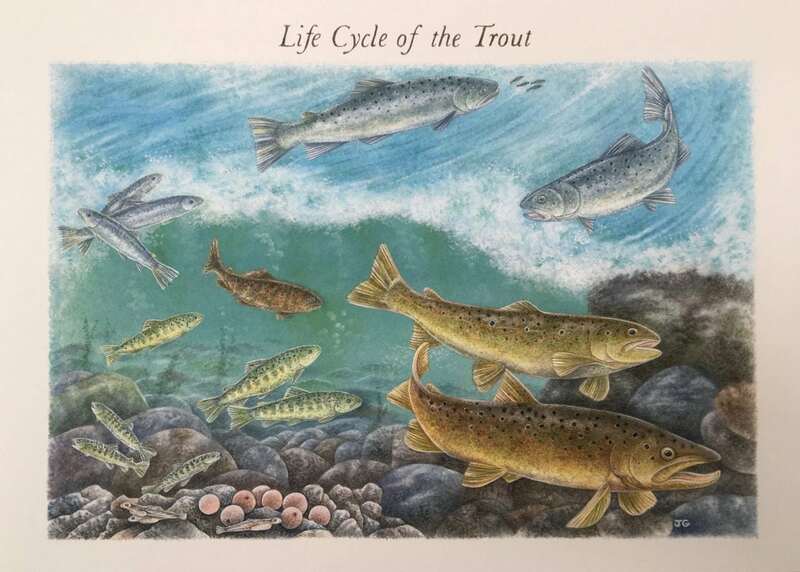 Learn more about trout below; their lifecycle, the threats they face, and what we are doing to help protect and nurture them. Brown and sea trout are the same species and can even derive from the same parents. Most sea trout are females! Trout (brithyll in Welsh / breac in Gaelic) either spend all of their lives in rivers and lakes, or migrate to the sea as sea trout. The presence of wild brown trout is indicative of clear, clean water and a healthy environment. Why do trout need our help? Many rivers are no longer clean and healthy but suffer degraded water quality and loss of habitat and food chains. Modern intensive agriculture, road run-off, water abstraction and poorly treated sewage are largely to blame. Excessive water abstraction and impoundment alters the natural flow of rivers, reducing available habitat. It also exacerbates the impact of poor water quality by cutting back dilution of water pollutants. This impacts upon the variety and abundance of freshwater invertebrates - the brown trout’s principle diet - which are much less abundant than in past decades. In many rivers, brown trout are unable to reach the best spawning areas because of man-made barriers, such as hydro-electric dams or impassable weirs. Barriers that are passable for young trout can still hinder their journey, slowing them down and making them easy targets for bird, mammal and fish predators. Young sea trout are forced to run the gauntlet of open-net salmon farms, where sea lice incubated in vast, unnatural numbers on farmed fish latch on to and kill wild fish. Sea trout are especially susceptible to sea lice in salmon farming areas because they tend to forage along the coast during their marine phase, rather than moving with salmon into the open ocean. Salmon & Trout Conservation addresses all the above issues, but we particularly campaign for improved water quality and quantity and better protection for trout.